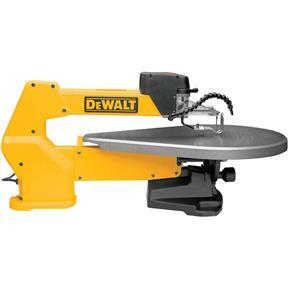 The dependable DEWALT 20-Inch Variable-Speed Scroll Saw is designed to help you create accurate, detailed workpieces with ease. Its user-friendly configuration with easy-to-access controls, reduced-vibration design, and variable-speed performance allow for incredible precision. For added convenience and durability, an integrated cast-iron table provides material support, and a flexible dust blower helps keep your work area pristine. 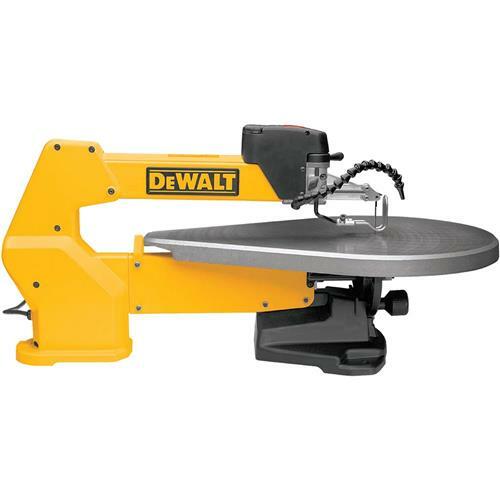 Optional G5808 Scroll Saw Stand not included. Cutting capacities: 2" @ 90 deg., 1-3/16" @ 45 deg. So far I like everything about the saw (blade change, dust blower, etc. )except the table adjustment. It feels cheap and flimsy. For the price point I think DeWALT hit a little low. I'd recommend the light and adding a foot pedal. Price was very good and arrived quickly. Highly recommend. Bought this in December and had prompt delivery. All parts were there and assembly was straightforward. This is a quality machine. I also appreciated the helpful staff at Grizzly who expedited my order.